Professor of strategy and international management at California Polytechnic University in San Luis Obispo. He earned a BS in business at Indiana University and MBA and PhD degrees at the University of Washington. He has authored or edited 14 books and monographs, over 110 published papers, and over 35 case studies; he serves on the editorial boards of several leading international academic journals; he served as the Saastamoinen Foundation Chair at the Helsinki School of Economics in Finland; he was the founding chair of the Strategic Alliances Committee of the Licensing Executives Society; he served as the chair of both the International Business and the Strategy and Policy divisions of the Administrative Sciences Association of Canada; and he is past chairperson of the Academy of Management’s International Management division. His research has appeared in the Strategic Management Journal, Academy of Management Journal, Journal of International Management, Columbia Journal of World Business, Management International Review, Journal of Management Studies, Human Resource Management Journal, Long Range Planning, Organisation Studies, and Journal of Applied Psychology, among others. He has received 11 “best paper” awards for his research, including the Decade Award for most influential article from the Journal of International Business Studies. His teaching performance has earned numerous awards in the United States, Canada, Asia, Africa, Australia, and Europe, including the University Distinguished Teacher Award. He was the first recipient of the International Educator Award from Cal Poly, and he endowed a scholarship for students to work and study internationally. Professor of management at Assumption College, in Worcester, Massachusetts. She earned a Ph.D. at the University of Massachusetts Amherst and an MBA at the Cass School of Business, City University, London. She has had expatriate assignments in Germany, the UK, Saudi Arabia, Japan, and Korea. Her interests include the role of culture in international business and the pedagogy of international management. Her publications include The Blackwell Encyclopedia of Management. Vol. 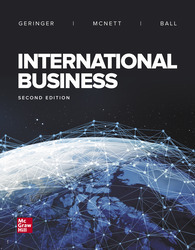 VI: International Management, 2nd ed., Oxford, UK: Blackwell Publishing (2005); and The Blackwell Handbook of Global Management, Oxford, UK: Blackwell Publishing (2004). Her teaching, research and presentations have received many awards, including The Roethlisberger Best Paper of the Year Award from the Journal of Management Education and the Alpha Phi Alpha Teacher of the Year Award. Her articles have been included in journals and collections focused on teaching in the area of international business. She is an avid master rower and enjoys running, reading, and gardening.